Having won my schools' Debating Society shield - twice, you would have thought that I would love a good argument, but nothing could be further from the truth. A childhood of being caught in the crossfire of two warring parents blaming each other for their respective hoarding habit consequences (among other things), which generally began with the daily ritual of my father belllowing; 'Where's the bloody car keys?' and my mother retorting; 'I don't know - you had them last!' and things going from bad to worse as they turned the house over looking for said car keys so my father wouldn't be late for work, when all along a never-used set of brass key hooks in the shape of a vintage car glinted ironically on the hall wall. 'Oh stop shouting you two!' I would sometimes hopelessly interject when the vein in my father's neck started pulsating rather too dangerously. My sister took a more aggressive stance and would eff and blind at them to stop at the top of her voice, but neither of our approaches worked and my sister grew up to be a hoarder who never dares invite anyone round to her place in her own right, presumably in a spirit of 'If you can't beat 'em, join 'em'. Such did all the arguments revolve around the state of the house and everything lost in it (to the extent that half a dozen tubes of toothpaste would often be on the go simultaneously - each time an item was lost my mother would just buy another one and then the previous toothpastes would resurface, adding to the clutter). Picture the replication of this scenario ditto all household products for full technicolour effect, the only item not replicated being the family car whose nomadic keys created such a daily bone of contention. I regularly marvelled at old photographs of me and my sister as toddler and baby playing on a living room carpet whose gaudy yellow chintz pattern was entirely visible (and crawlable) and once joked to my mother that if the house was ever clean and tidy again, what would she and my father talk about? They'd have to have proper conversations! She smiled and shrugged off my comment. She's always been good at letting life wash over her like that - presumably the reason she survived 44 years of marriage with my impossible father. Still, my father effectively controlled the household through his moods so I now see it as no accident that I went on to date a couple of boyfriends who tried to control me through their moods and put downs in my late teens and early twenties, just as he had. It wasn't that I was some sort of masochist, though lack of confidence and belief that I deserved someone who treated me better undoubtedly played a part, more that I now realise I was subconsciously re-creating my psychological relationship with my father in a futile attempt to resolve what I had been unable to resolve with him. So in a way my consciousness was seeking to become emotionally healthy in its own warped way, except it had no template to go on in terms of going about it the right way, so the trial and error process took a while, eventually aided by the rise of the self-help book. On a more trivial note, such was my timidity over confrontation of any kind in those days, it took me years even to be able to take faulty goods back to the shops! Aside from my career moves forcing me to become more assertive over the years (you soon learn that you have to be able to stand up to students and their demands and convince them university rules are there for a reason or they will walk all over you), I am now fortunate enough to enjoy a relationship which is a criticism-free zone by mutual consent, as my partner has also known more than his fair share of criticism and arguments in the past and doesn't harbour a taste for a future of more of the same. The worst thing about arguments is how trivial and pointless so many of them are. Who cares if someone leaves a toilet seat up? Who cares from which part of the tube someone squeezes the toothpaste? Not me. If individuals are going to argue, they should at least argue about something that actually matters, though some psychologists would argue that a lot of trivial arguments arise entirely because the 'elephant in the room' - ie the real issue - is being avoided and suppressed to the extent that a cluster of trivial issues have to break out in order to relieve the pressure cooker. Better still, people should take the elephant in the room by the tusks while it is still a baby elephant in my view so they don't end up resorting to the physical or verbal aggression of the inarticulate. Problems only become more difficult and painful the longer they are ignored or suppressed rather than brought up and discussed as soon as they present as an issue. Emotional constipation ensues, resentment builds, emotional and physical health issues follow, the dangers of implosion or explosion then rear their ugly heads (depression is apparently anger turned inwards). Ultimately an issue which might have been solveable to begin with grows to the proportions where no one can begin to handle it anymore, let alone solve it. Who can live like this and stay sane? Again, not me. Worse still, so many arguments even when serious, turn out to be down to a crossed wire, a mis-communication or no communication at all between parties, leading to false assumptions and misunderstandings and people not getting their needs met when in many cases all they have to do is open their mouths and ask/be willing to acknowledge and negotiate the other partys' needs in return. How many wars too might be prevented if human beings would only communicate properly I wonder? So next time you find yourself treading on eggshells around someone, ask yourself why, and would they do the same for you if you were the moody one? And what is the elephant in the room that they are trying to hide anyway because you can bet your bottom dollar there is one, unless they turn out to have a medical reason for their behaviour such as a severe hormone imbalance. These days I no longer fear confrontation but nor do I court it. Notwithstanding it is largely ineffective in getting anything resolved (and I've been on problem-solving courses which reiterate this), so why bother with an ineffectual tactic that just promotes circular repetitive argument where positions harden and both sides become resolute in their righteousness? At least in a Debating Society, it is structured argument where everyone gets a fair say and the audience then get to vote on the outcome. 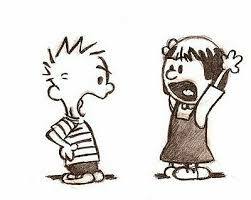 Perhaps every domestic environment experiencing difficulties should invite its local debating society along to arbitrate. I feel a new reality TV show coming on! Jeremy Kyle has had his day now anyway. Your post is very timely for me. Having just taken on the management of a staff of 15 I'm finding that dealing with conflict takes up a major chunk of my role, me, whose first reaction is usually to avoid any kind of argument. Tackling things head on and with a sense of calm and perspective very much seem to be the prerequisite for a positive outcome. It's tiring but not as tiring as getting your horns locked in a pointless battle of wills. Thanks for your empathetic comment Steve and good luck with your management role. A very useful tactic I've found is to actually confront someone with their behaviour ie; You appear to be using your moods to try and control this situation/repress debate about it. Why don't you just talk to me and tell me what the problem is? You might get it solved then.' Of course they will be furious at first, but they will also be rumbled and have no choice as to realise their tactic doesn't wash with you and you can see straight through it. And for those whom such behaviour is subconscious, they are likely to be even more shocked, but ultimately in a good way if they subsequently see how others perceive them and the need to change their tactics accordingly. I see a lot of young women who still turn on the crocodile tears to get what they want and I have no hesitation in telling them that I know what they are doing and it won't work with me because I'm also a girl! I was thinking I'd write something extremely meaningful and learned in response. Having started I decided it was trite and rather a silly exercise. So instead can I point you to "The Games People Play" by Joe South? A very insightful post and it sure resonated with me. The generational ripple effect is something that has always fascinated and the "destined to repeat" syndrome unless awareness is attained. I could study my own family for the rest of my life :) and not be finished. Marginalia. A timeless classic, I know it indeed. Thank you. WWW, I have just commented on an equally evocative posting of your own about that pang of yearning one feels for the lost love who didn't work out, but actually there was probably a good reason for that in the cold light of day (and some maturity later)!